Bristol Rovers are back in League Two after winning promotion from the Conference last season. 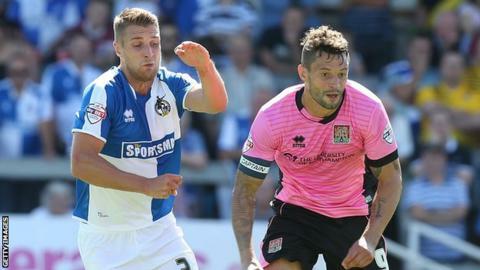 Bristol Rovers' return to the Football League ended in defeat as John-Joe O'Toole scored against his old side to give Northampton an opening day win. Northampton's Marc Richards shot wide early on, while Rovers' Matty Taylor lost control after latching on to a poor back pass and rounding Adam Smith. O'Toole finally put the Cobblers ahead with a bullet header from six yards. Rovers rarely threatened but should have equalised when Ellis Harrison fired straight at Smith late on. "It was a disappointing day to be honest - we never got ourselves going. The first 45 minutes was a typical first game of the season. I asked the lads to calm down a little bit in the second half and get our football going. "We had a great chance to take the lead, which is disappointing when a good chance comes along. We didn't deserve anything from the game." "It's a great day for us, it was a great effort from our supporters too. "We had to defend and we had to defend well. When we passed it around we opened them up; Marc got into some good positions. "John-Joe had a tough year last season. He has to do better, but we backed him today and it was a great goal." Match ends, Bristol Rovers 0, Northampton Town 1. Second Half ends, Bristol Rovers 0, Northampton Town 1. Corner, Bristol Rovers. Conceded by Ryan Cresswell. Corner, Northampton Town. Conceded by Tom Parkes. Josh Lelan (Northampton Town) wins a free kick on the left wing. Substitution, Northampton Town. Paul Corry replaces Nicky Adams. Attempt saved. Marc Richards (Northampton Town) left footed shot from the left side of the box is saved in the bottom left corner. Attempt saved. Ryan Cresswell (Northampton Town) header from the centre of the box is saved in the top left corner. Foul by Jeffrey Monakana (Bristol Rovers). David Buchanan (Northampton Town) wins a free kick on the left wing. Corner, Northampton Town. Conceded by James Clarke. Joel Byrom (Northampton Town) wins a free kick in the attacking half. Substitution, Northampton Town. Sam Hoskins replaces John-Joe O'Toole. Substitution, Bristol Rovers. Billy Bodin replaces Matty Taylor. Substitution, Northampton Town. Ricky Holmes replaces Alfie Potter. Attempt blocked. Josh Lelan (Northampton Town) right footed shot from outside the box is blocked. Substitution, Bristol Rovers. Jeffrey Monakana replaces Cristian Montaño. Attempt saved. Cristian Montaño (Bristol Rovers) left footed shot from outside the box is saved in the centre of the goal. Josh Lelan (Northampton Town) wins a free kick in the defensive half. Goal! Bristol Rovers 0, Northampton Town 1. John-Joe O'Toole (Northampton Town) header from the centre of the box to the bottom right corner. Assisted by David Buchanan with a cross. Attempt missed. Jason Taylor (Northampton Town) header from the centre of the box is high and wide to the right following a set piece situation. Second Half begins Bristol Rovers 0, Northampton Town 0. First Half ends, Bristol Rovers 0, Northampton Town 0. Attempt blocked. Marc Richards (Northampton Town) right footed shot from outside the box is blocked.